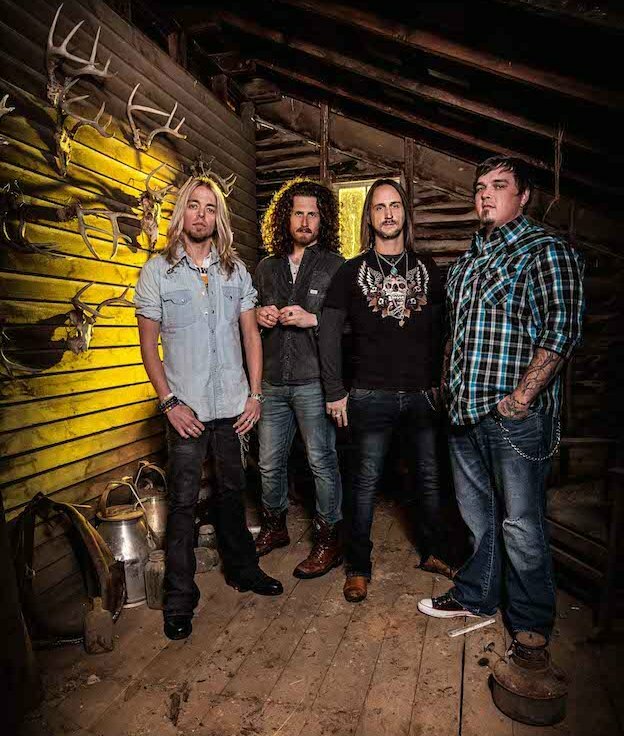 When it’s coming to southern influenced heavy rock, one can’t pass BLACK STONE CHERRY. entertaim.net supports that group since years – because it’s not easy to find such a bunch of straightforward guys never pretend to be more than they are. With their last album “Magic Mountain” they succeeded not only in the US Billboard charts, they even managed to top the UK Rock Charts. Just before the gig at the Essigfabrik, Cologne, Martin Hannig had the honour to talk with John Fred Young, the drummer and heart of the band about the european tour, the last album, and some drumming stories …. photo by courtesy of Warner, by Ash Newell. entertaim.net: Hi Fred. We have that running gag with you – first question as every time: do you have become a millionaire by now? John: (laughs): No – very far from it! entertaim.net: I thought so. But you had quite a success with your last album in the UK. John: Yes it went No. 1 on the Rock Charts. Also “The Devil And The Deep Blue Sea” did very well. We’ve been very fortunate the last three years in the UK. It’s really awesome. Tonight here with our headline show we got 900 presales – that’s really good! entertaim.net: You played Copenhagen last night. How was it? John: Great! It was the biggest crowd we’ve ever head in Copenhagen! We normally play a club called Loppen – it’s very medieval (laughs) in a small room. We played another big room there and lots of people showed up. entertaim.net: Did you had a day off? John: Yes we had it before to see a lot of the city. And Christiania you know. entertaim.net: And you were there! Must be kind of strange to see that as an American. Even for me it’s wired – buying drugs like in a supermarket…. John: The thing is it all was an experiment in the 70s and it’s kept going on…. It’s unique and and probably one of the onely places in the world like that. entertaim.net: Some US states have been legalizing it – like Washington, Colorado. What do you think about that? John: Great. I think marihuana should be legal. I don’t consider it a drug because it’s a plant, it’s natural, god put it here…. There has been a lot of research on it. The medicinal benefits of marihuana for patients who have like MS or cancer are obvious. I know there’s a lot of people who think marihuana is evil: “oh my god you smoking pot!” When it’s used just like any other herb on earth it has great positive effects. The generations now are starting to see that. My grandparents used to grow hemp in America. And hemp is the cousin to cannabis – it’s a little different, it doesn’t have the THC level. It was used for everything – bags, ropes, clothing. Kentucky is about to legalize to grow hemp again. It passed along back in the 30s. To be honest it’s all political, very much propaganda against marihuana. entertaim.net: I really really wondered about that it’s possible in the US to legalize it in some regions – as you said it’s all political! John: They did it! You know they see so many tax dollars in it. It’s a lot of money there. There is Washington D.C. in the east, and Washington state in the west, and those are two very different places of the country, but hey both see the revenues. And there a couple of other states, like Michigan have made it medicinal. It’s like a movement. It will take a bit longer for the southern states, they are very conservative in a lot of things. We live in a county you can’t buy alcohol you know what I mean…. The statistics for somebody using marihuana and hurting somebody – compared to drinking and driving? Come on dude! entertaim.net: Everybody knows that. We have that discussion in Germany as well. But we have very strong conservative partie here, like the 2 biggest parties won’t accept it anyway. I don’t think that we ever gonna get it here. You know if I wanna buy some weed I know where to go. Everybody knows it. It’s ridiculous. John: What is the penalty here for smoking it? entertaim.net: You are not allowed to own it or to smoke it. But you won’t be punished for a joint. There is something like a limit you can have without being charged with a crime. But it’s not allowed anyway. If you have more than the allowed limit you will get a fine at least. John: Do you go to jail? entertaim.net: Not for smoking! You shouldn’t do it in public you know. But now: let’s talk about your drumming! You are a drummer for so many years now. Do you have to rehearse to get even better? John: It’s crazy because I started out when I was 14. I got a drum set from my uncle when I was 5, and I just beat on it you know, didn’t know what to do. And when I was 14 Chris the singer and me, we started playing together. We rehearsed at my uncles old rehearsal house down at the farm. I still try to learn all the time. I just added a double bass drum and have a double bass kit now. I’m trying to become better and better. As a musician, the day you feel comfortable that’s when you stop learning. I try to learn every day, I try to practice rudiments, or my feet, and stuff. entertaim.net: So you never had any professional lessons by a drum teacher? John: No, my uncle he’s a good drummer you know. He looked after me and showed me rudiments. Regarding to playing he helped me a lot. A lot of things I learned when I was in a school band. That’s where I learned rudiments and a lot of discipline as a drummer. John: Cool yeah! I got that from my uncle! He plays in an awesome country band called The Kentucky Headhunters. He has this really cool backbeat thing. We were in the studio and it was just 4/4 beat – bang bang bang bang. I was like “man that doesn’t swing.” I was like (makes the sound of the hihat beats) That feels so much btter. I think it’s cool the way it came out! John: I love that stuff man! It’s so funny. I don’t know if you guys are tired of hearing it in Germany – the house, electronic movement. You know on this record we worked with a guy called John Barresi. And so we discovered MASSIVE ATTACK! Oh dude! Great record, “Mezzanine”! entertaim.net: That one is one of the best records ever made I guess. I love it! John: Yes it is absolutely! entertaim.net: Do you have been influenced by a drumming hero in your youth? John: Fred my uncle! John Bonham. Mitch Mitchell. Ginger Baker, he’s so badass, the polyrhythms he did. Tommy Aldridge. Who else? Ian Paice of course. And Buddy Rich, Gene Krupa. There’s a guy from Germany called Benny Greb. John: Really great drummer ! Really tough. He just slams it man. He’s so good. I recently got to meat him and speak with him. Really great. John: Max Weinberg! Yes! He’s incredible! And his son is a good drummer! entertaim.net: There is the beautiful song “Sometimes” on the new record. And I instantly thought of “Freebird”. John: Thank you man! Yes Freebird – you know it’s one of the songs everybody knows everywhere in the world. We jammed to it a lot! “Sometimes” is a bit a reminiscence to Freebird I guess. We wrote that song with a guy in Nashville called Craig Wiseman. It was supposed to go on the 3rd record, it never made it, because we came up with “In My Blood”. So we said we save it for the next record. Somebody told me that this could be a big song in Germany. Just because the way of the radio format here. entertaim.net: I wondered about your ever changing bass drumheads. I watched Rock am Ring festival on TV and you had this rooster on it, than later on tour some girls. Has it any meaning, and who is doing that pictures on it? John: It’s just fun you know. Actually this tour I switched to double bass. I got two indian girls on it. I try to have something cool every time. John the bass player and I do the illustrating work. Try to go back and forth you know. We have a company in Minneapolis for our tour supply, they are making the specialized drumheads. entertaim.net: What are your plans after the european tour? John: Go home and rest. I’m gonna have a girl coming, I will be dad in November! John: Absolutely! Gonna be a lot down at the house and be a good dad! I’m looking forward to! entertaim.net: It’s your last time on tour as a non father…. John: Yes. The last tour I ever do (laughs). entertaim.net: When will you meet again with the band? John: Probably we do a home show in Kentucky middle of december. And then we start touring the US maybe 1st february , then come back over here in summer. entertaim.net: Well see you then again! Good luck with your family! John: Thank you very much man!